If I were going to pull an epic heist on a diamond planet, wouldn’t hiding out in a universally massive void that is larger than galaxies (and has less going on than Kadykchan, Russia) be an excellent choice? Perhaps there we could start the first universal free trade black market. Maybe we could add a little activity to these voids and make them less… well, void. By definition, an astronomical void is a space with few to no galaxies in it. These voids, along with superclusters (a mosh pit of galaxy clusters) are thought to be the largest things in the Universe. These things are huge – and I mean these voids may reach up to 500 million light years across! Quick light travel recap: If you are two blocks from me and I turn a flashlight on and off, the light seems to reach your eyes almost instantaneously. But the light from the Sun takes roughly 8 minutes to reach Earth as it travels over 92 million miles. In some of these voids, you have to wait hundreds of millions of years for light to cross from one side to another. So in reality, for us to actually cross one or even just hide out in one is rather improbable (and don’t start thinking that traveling to one would be easy – they are pretty far away, too). The closest void to us on Earth is the Local Void (clever, right?). This guy is 150 million light years across and sits at the edge of our local group of galaxies. 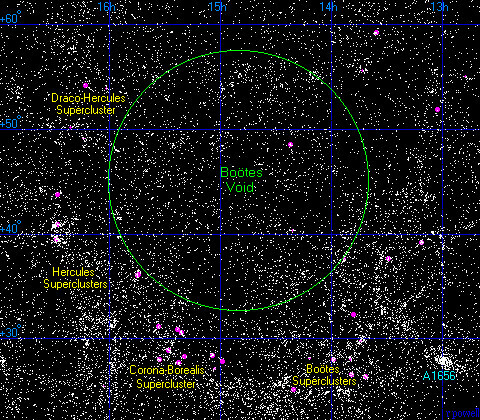 It is believed that the center of the Local Void is at least 75 million light years from Earth. 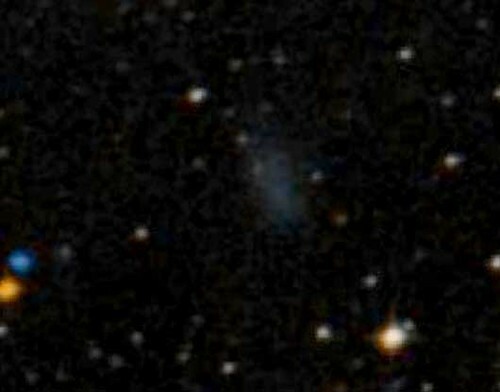 So far one dwarf galaxy, Eso 461-36, has been found traveling at 135 miles per second through the Local Void towards someplace more exciting. By comparison, the Milky Way and all its neighboring galaxies (the Local Cluster) are moving away from the void (due to gravity) at around 175 miles per second. Apparently this is not a popular cosmic “hang out” spot. The stars you see in the circle are actually in front of the void! The next big nothing on our list is the Eridanus Supervoid, which is located in the direction of the constellation Eridanus, about 6 to 10 billion light years away. To be fair, this may not be a void at all. But if it is, this monstrosity is around 500 million light years across and would be one of the largest structures in the visible Universe. To give you an understanding of why we think this void is out there, we have to look at the Cosmic Radiation Background (CMB) of the Universe. 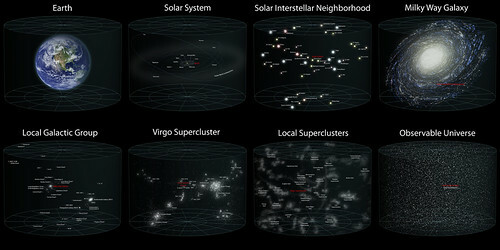 Simply put, in a very young Universe everything was much closer together and much more dense. This density created a lot of heat, and as the Universe expanded it cooled. 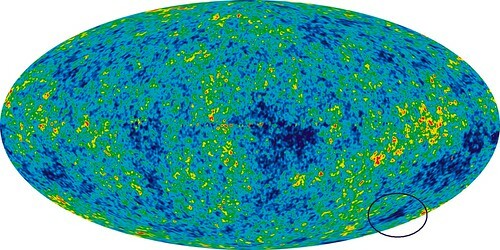 But the radiation from those early times is still visible, and that is the CMB. By looking at the CMB, scientists can find variations in temperature in the Universe, and these variances can show us where things are clustered (like galaxies) and where things are empty (voids). The clusters give off more energy than the voids and create these variances. One of the largest cold spots found is theorized to be this supervoid. There are definitely other theories about this cold spot, but that’s not what this blog is about. What causes theses voids? Gravity’s very lengthy grasp likes to set everything up in nice packages in the Universe. So as life goes on in the cosmos, things start to aggregate towards each other into clusters. Like moons around a planet, planets around a star, and stars around a massive black hole (like in the Milky Way), galaxies cluster together into what we call, well, clusters. At any rate, when these clusters form, voids are left behind… and as time goes on, more and more of these clusters form, and the voids multiply and combine into more and bigger voids. Generally, with the standard model of the Universe, scientists can calculate how big these voids should be and what is inside them. But occasionally we get some surprises, as in the Eridanus Supervoid – it’s exceptionally big! But in science there are often more questions than answers. Now that we’ve explored large nothings in the cosmos, maybe we can find a light at the end of our tunnel. And maybe that light could actually be a large burst of high energy gamma rays coming from my favorite thing in the Universe, a Magnetar. If you have any questions that need to be answered or just want to comment on the awesome blog you just read, have at it and I may regard it in the next blog.